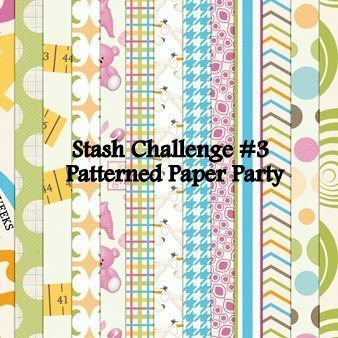 The May Challenge at Scrap Our Stash is a Patterned Paper Party! 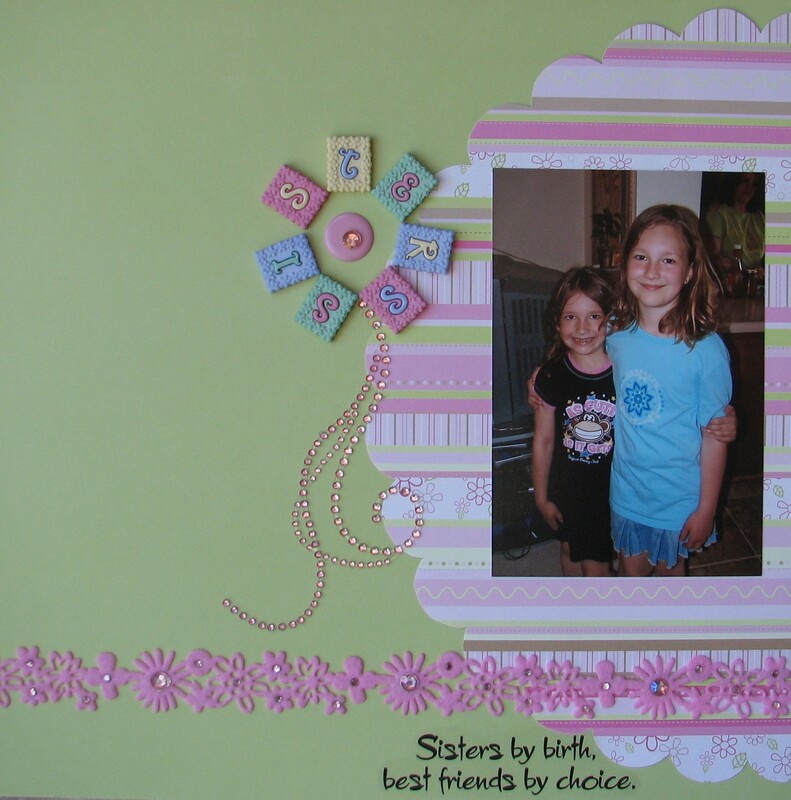 Create a layout using THREE or more patterned papers from DIFFERENT collections. Supplies used: EK Success Overton House Designs paper, Heidi Grace Designs paper, unknown stack paper, Making Memories Simply Stated Heidi Large White Alphabet Rubons, Stickabilities Alphabet Stickers, Prima Flowers, Michael’s rhinestones, and ribbon. Sketch from Imagine by Close to My Heart. At first I thought it was going to be difficult to mix patterned papers because I have switched to buying packs because they are so much easier to coordinate. But what do you know…I have some really old paper! This challenge was a good thing because these papers would normally be my last resort. So single sheets here I come and this is what I came up with. The best way for me to mix pattern papers is to choose one multi-colored paper as a starting point, then find mono-toned or less busy papers to go with it. You can see this from my layout. I have the striped paper and polka dot papers (mostly covered) as my busy, multi-colored sheets. Then I added the pink flowered sheet, brown flowered sheet, green polka dots, and pink/green flowered sheet. I have a large supply of Making Memories alphabet rubons making those the first that came to mind. Even though I have a large stash, I do use them often. They are good quality and make a quick way to add a title, similar to alphabet stickers but with more letters to use. Now I will share the funny part of doing this layout. I was as far as the pictures on the paper, just had to add a title and embellishments, when I realized that these are Christmas pictures – not birthday. I certainly wasn’t going to start over at that point. I decided that I did use pink and green so that’s close enough to Christmas colors. I was just focused on how well the paper matched her outfit and I guess that’s what happens when your child has a birthday so close to Christmas. What will you create? Go to Scrap Our Stash to submit your own layout. You have until May 29th. 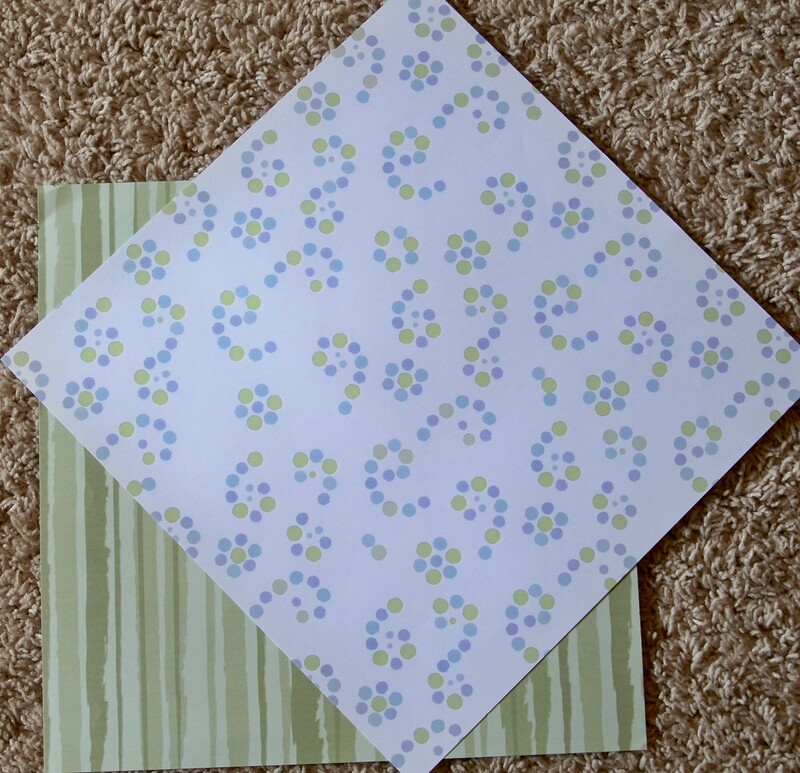 Sometimes we purchase a stack or pack of scrapbook paper where every sheet isn’t a favorite, or maybe we’ve had something in our stash forever and our tastes have changed. I have found that I don’t like now what I liked years ago. What do we do with scrapbook paper that we don’t like? The current Use it or Lose it Challenge is to alter paper. This is a great technique to use up some of that not-so-loved paper. if it is double-sided, flip it over and use the back. break it up into smaller pieces. I don’t care for busy patterns but they are better in smaller doses. add embellishments that you love. The thing that works best for me is to mix something I don’t like with something I really do like (sketch, color, embellishments, etc) to balance things out. Supplies used: CTMH Paper Pack, CTMH Cotton Candy cardstock, CTMH Cotton Candy ink, CTMH So Blessed stamp set, CTMH Playful Flourishes stamp set, DCWV alphabet stickers, Versamark ink, CTMH brads, K & Company Grand Adhesions, and Heidi Grace Velvet Borders. I did a few things to change the papers. First, I randomly stamped the pink butterfly onto the patterned paper. This added more color. I always like pink and the original shades of color were too pale for my taste. I also added a few pink brads to this paper. The green striped paper I used the back side and stamped flourishes with Versamark ink which gave it the look of a watermark. This is a great way to add a subtle pattern without overpowering your layout. Another way to do this is to stamp tone-on-tone by using the same color ink as your paper. You will get a similar effect. The blue paper is not included in my before photo but it was polka dot in the same colors and again I used the back side. I really don’t like using solids anymore so to add a bit to this paper I embossed it with my scoreboard. Overall the layout still seems a bit plan to me but I think it’s the solid background that I chose so I’m just letting it be. Products used: Prima Say it in Crystals, Queen & Co. Felt Fusion, Darice rhinestones, Kaisercraft rhinestones, Miss Elizabeth vellum sticker, Heidi Grace patterned paper, CTMH cardstock, and unknown letter buttons. Based on a sketch from ScrapSketch. Layout Challenge: #24 of 210. 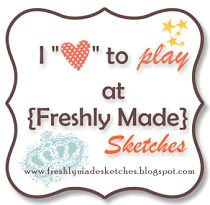 This month I am a guest designer at Scrap Our Stash. The March challenge is to combine the old with the new. That was the inspiration for this layout. I pulled the paper out of my “old” collection and I have had those letters forever and just haven’t gotten around to using them. The vellum sticker quote was also from my old stash. The felt border and bling are both new favorites. I used Bazzill Basics scalloped circle and traced it on the back of my pattern paper and cut out for my own diecut piece. I also added the rhinestones to the felt flower border. 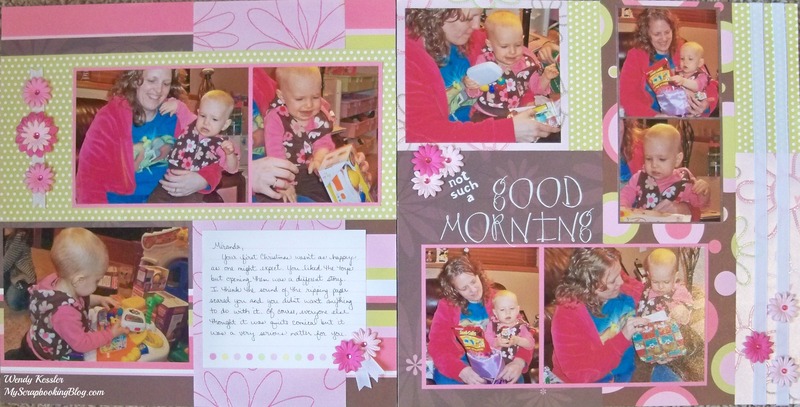 Be sure to check out the Scrap Our Stash Challenge! I’d love to see your new/old combinations!